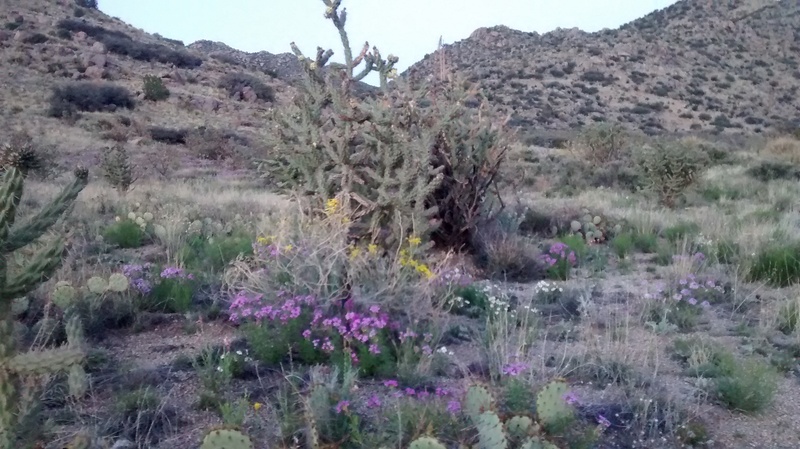 This music has a Southwestern flare and reminds me of the ambiance of this evening ride. In our times we have an industry driven transportation culture. Gear guide magazines recommend having a different bicycle in your quiver for every occasion. I don’t even have a garage, let alone a stash of complex equipment. I have one bike and I use it for everything. 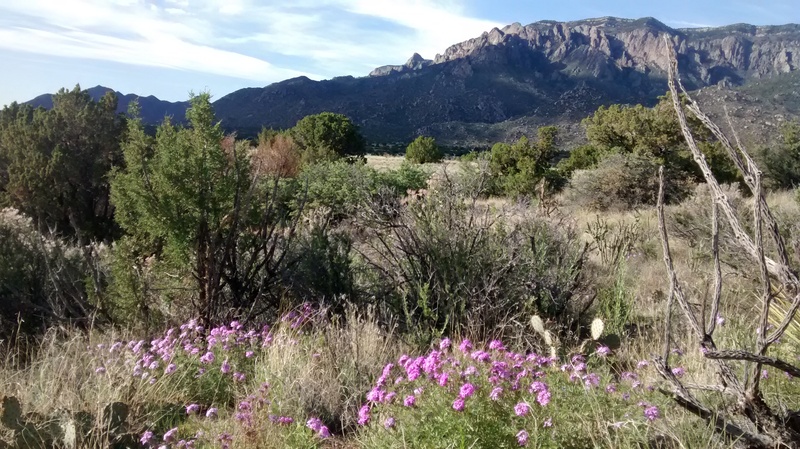 Yesterday afternoon I wanted to get out and enjoy the trails next to the Sandias. 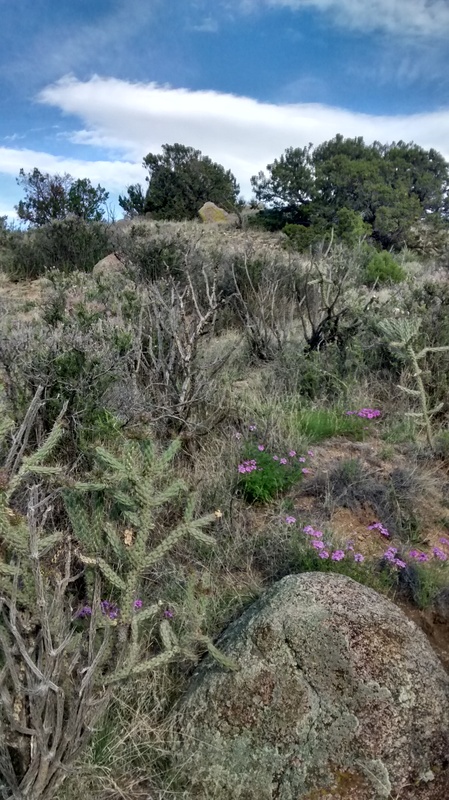 I took the I-40 trail up to the Tramway trail and slipped through the quiet neighborhoods that splay out on the tip of the Sandia’s alluvial fan, which stretches down to the sinuous river, until I reached the pebbled granite trails flowing along the mountain’s undulating foothills. It felt good. I brought my sandals along and food in case I wanted to hike too. I don’t have a special carrying rack or anything, just a voluminously pocketed polka dot backpack that is borrowed from my wife (my backpacks are worn out). Now that I’m older any teasing directed my way for looking a little goofy rolls off of me as I’m assured substance and purpose comes from the inside out. I am taking all these photos with my cell phone camera. I am surprised at the quality. My Cannon pocket camera that I’ve been using for the last eight or so years busted when I dropped it while bicycling up on the Pajarito Mesa. Sad, but I can still get my field work done. I’m saving for a new camera and a Go Pro. 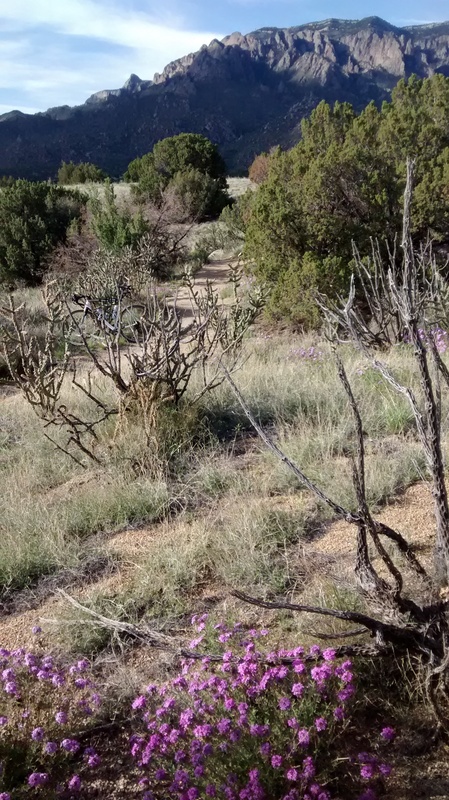 While situating myself for one of these photographs I accidently crouched down on top of a prickly pear cactus! It was like an acupuncture appointment gone bad. 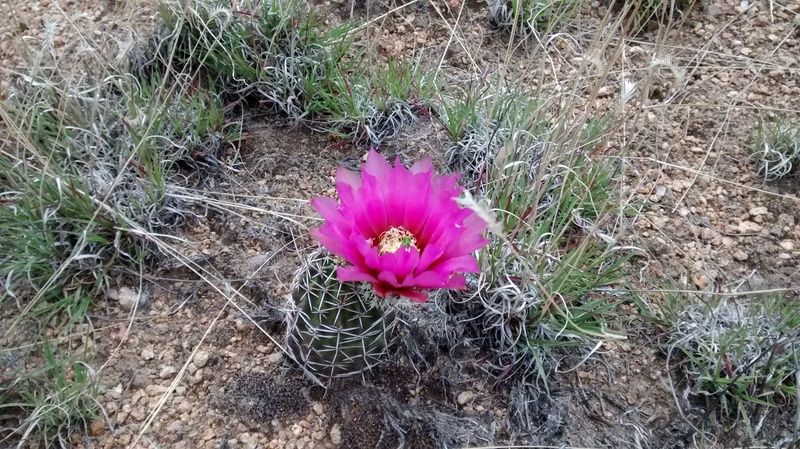 The high desert is beauty and the beast all in one. A couple people on mountain bikes said they had never seen someone riding a road bike out on the trails before, but I felt it was nimble and fine. 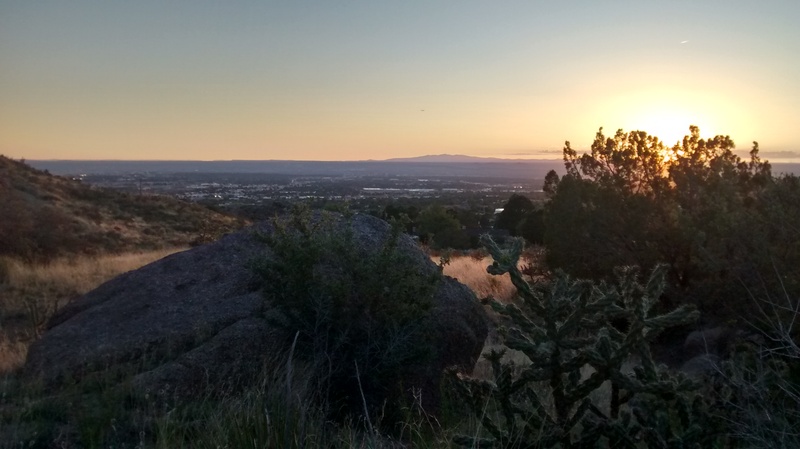 I used a Specialized Rockhopper mountain bike for my first road rides in Reno. 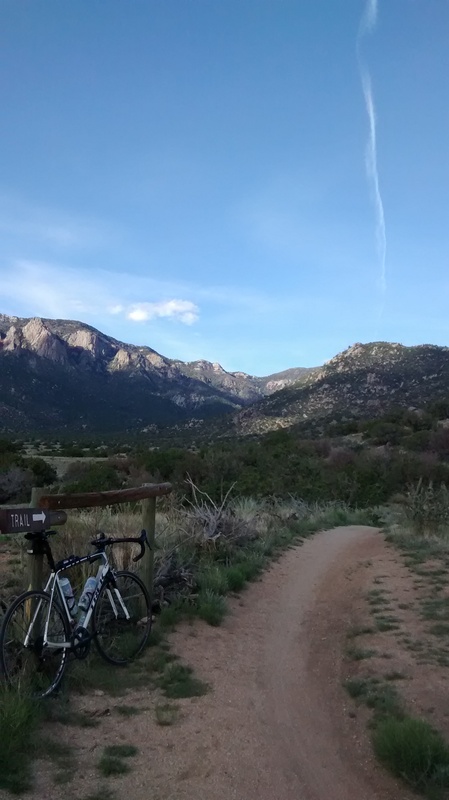 I started road bike racing on a cyclocross bike. 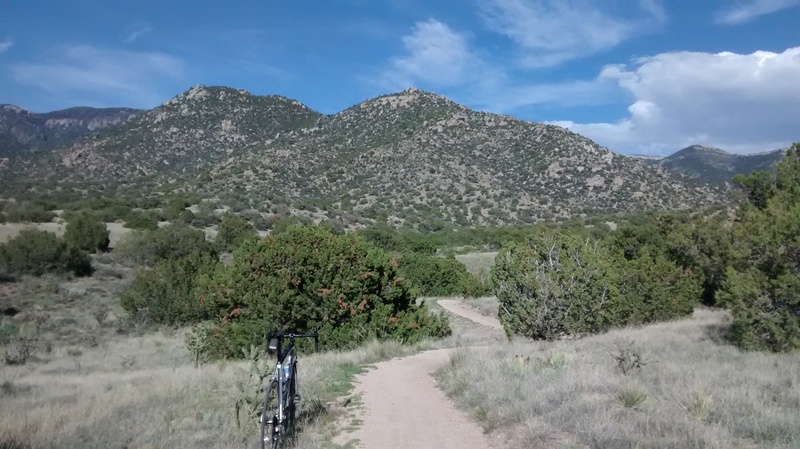 I rode mountain bike routes in Flagstaff on my cross bike. I was adapting limited means to do what I wanted. Innovation is not always necessary or good, but sometimes doing things differently stretches your imagination, and your budget. The most important thing is what we do with it. This one bike got me out on many beautiful trails. For this I am grateful. 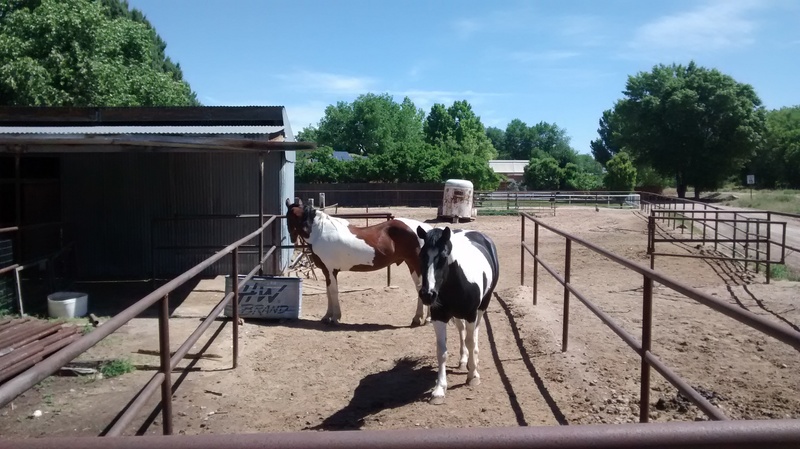 This entry was posted in Albuquerque, Everyday Rides, exploring by bike on May 30, 2015 by bikeyogiblog. I visited some of my favorite local bicycle shops yesterday to touch base and share news of happenings in the bicycling world. It’s energizing being around people whose love of cycling is infused with a strong local knowledge base. 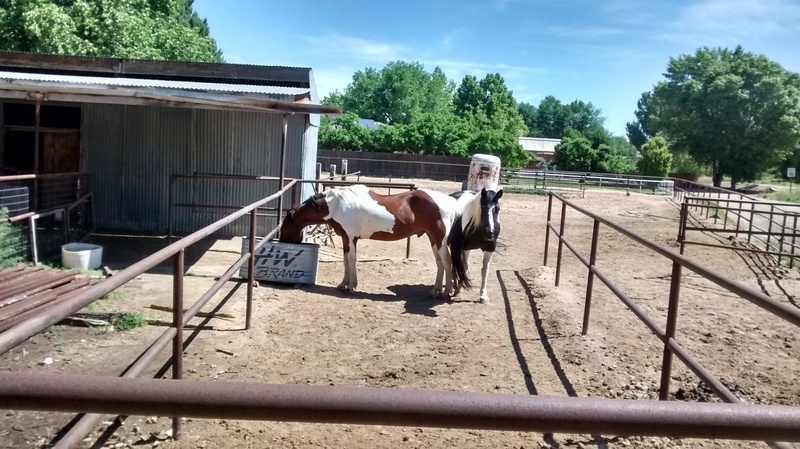 I share news from my neighborhood and travels, and on cycling planning and developments. But the biggest gains happen when I listen and people fill me in with their perspective. The exchange of information through casual conversation is mutually beneficial. Bicycling is all about the vernacular, the everyday world. The solutions we need to create today are interdisciplinary and holistic, because the challenges we face are interrelated and systemic. Our innovations need to apply a wide range of knowledge from multiple fields to affect complex systems in many ways. Making cycling easier and safer helps by tapping into the renewable energy potential inherent in people. It’s heartening to know the analytical framework has advanced to where cycling is recognized as a positive factor for making improvements in every area we are trying to grow and develop in. Cycling is renewable transportation, energy efficient, healthy, low cost, and democratically based. It makes total sense to facilitate better access to the mainstream transportation system to help more people enjoy walking and cycling. Change begins by desiring it. All the challenges we see for implementing better bicycling are really opportunities to pull together our resources and collaborate in a similar fashion like we did with the Apollo program, the moon shot. As I spool down the urban trail and glide by the river and past local farms I realize in that moment there is an elegantly simple solution. We know what to do. Designing a city with world class bicycling is a good goal and one that makes a difference in changing our lives, uplifting people and helping us exemplify shared leadership in a globally aware world. Bicycling infrastructure investment means a brighter future. I don’t think we were crazy or overly optimistic for wanting to go to the moon. It was an important step. 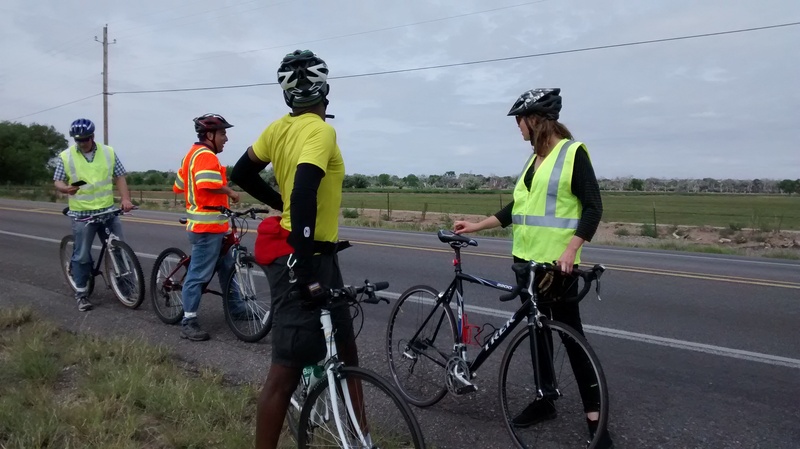 This entry was posted in ABQ bikeways planning, bicycle rides, Bicycling Ecologies, Everyday Rides, initiatives on May 29, 2015 by bikeyogiblog. 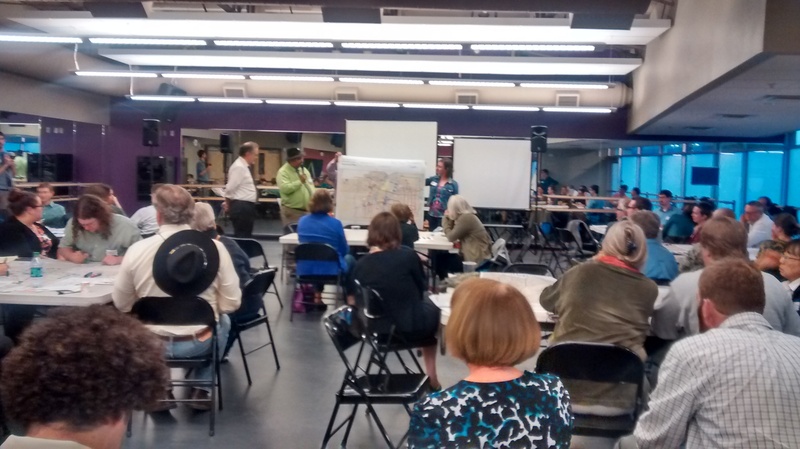 On May 21 I attended a community planning workshop as part of the Albuquerque/Bernalillo County Comprehensive Plan update process. 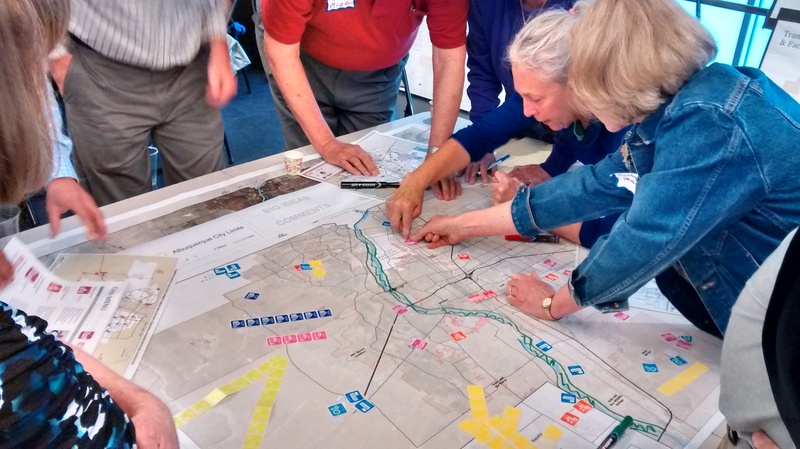 The city of Albuquerque is working with consultants to involve citizens in helping envision the best directions forward as we grow and develop. 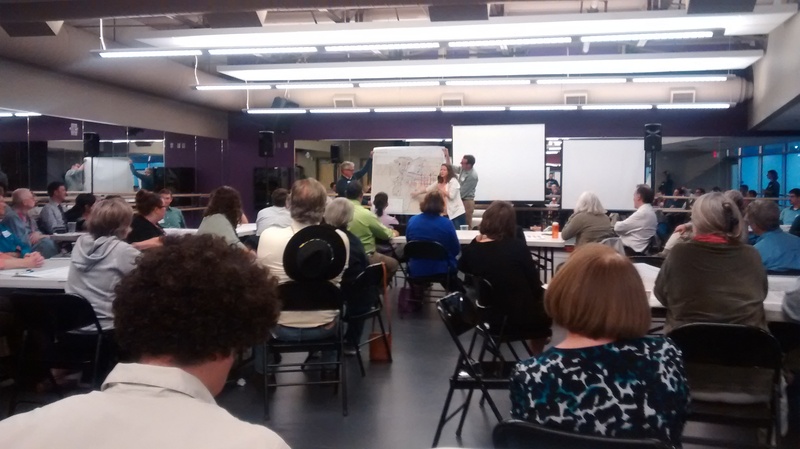 This workshop was held at the Hiland theater, home of the National Dance Institute, New Mexico. There will be additional workshops held June 23-25 for each city quadrant. Check abc-zone.com for the details. The planners and consultants gave us an overview of the planning process and polled the audience on our preferences and asked us to rank areas of importance. 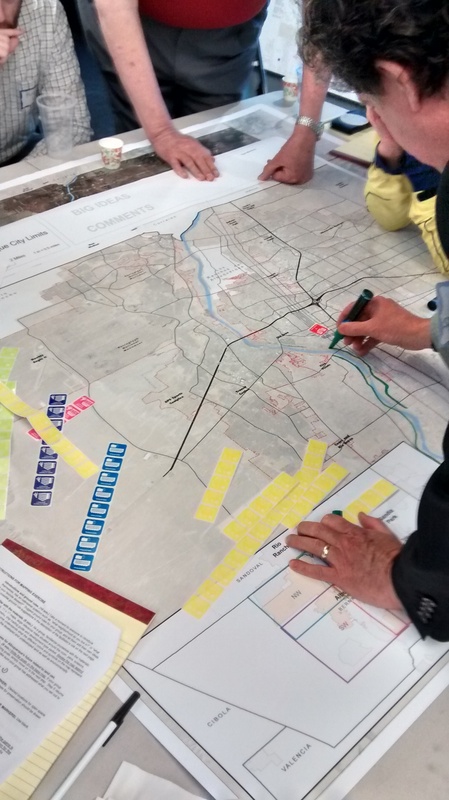 Then we broke into small groups to lay out land use patterns for how the city and county would move to match up human activities with the natural features for the optimal strategic development over time. 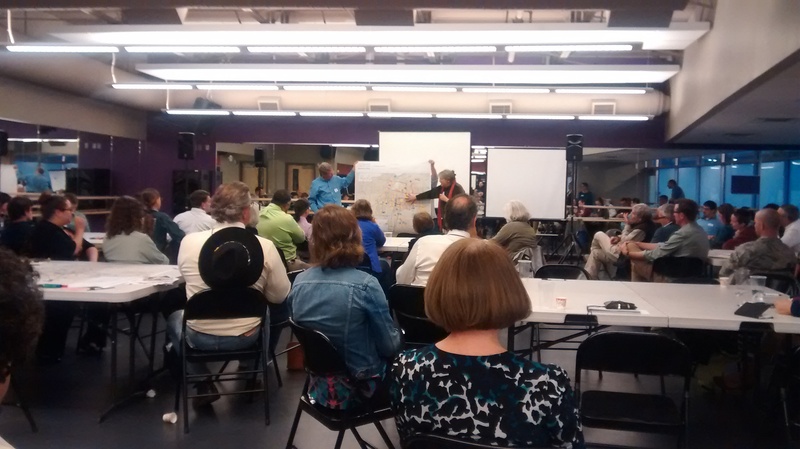 It was a very engaging evening and citizens had some serious fun mapping out scenarios for the future and presenting them to the whole audience. This workshop tested different scenarios in quite complex systems and flushed out unintended consequences. We are starting from the existing plan and conditions, and reconciling them with new knowledge, opportunities and the public’s sense of direction. The trending patterns are being compared with preferred outlooks based on structural changes in demographics. Views are evolving for a built environment more directed at serving the full spectrum of human community, in tune with the subtleties of place, soil, water, the natural ecosystem. There is increasing demand for creating opportunities for people to live closer to work and school, building the economy by promoting local food systems and place-based tourism, and fostering entrepreneurial job creation. The questions and analysis tend to sort by differences but the actual planning effort has to blend interrelated components together taking into consideration the overlays of natural setting, climate, and parallel planning areas, making sure all plans are well synchronized and all variables are taken into consideration. 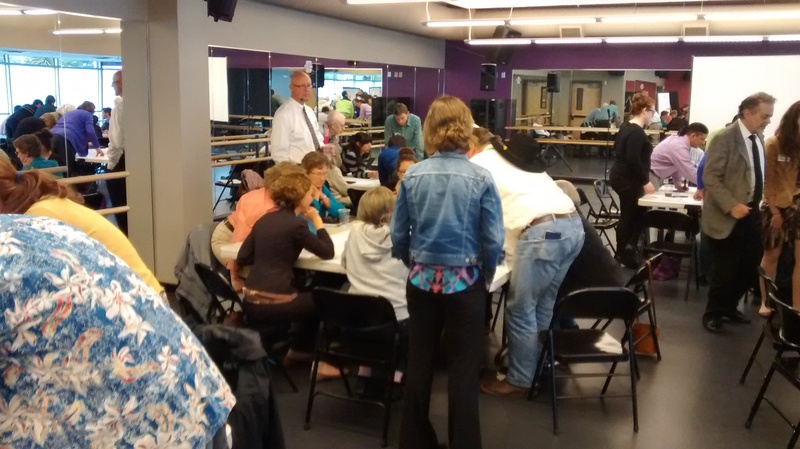 Different tables came up with widely varied outlooks. Planning themes of resilience, wise use, density, containment, spaciousness, and focus on quality and connectivity were all highlighted. The table I was at happened to be the most aggressive at projecting plans for geographic expansion. They wanted to develop everything not protected. 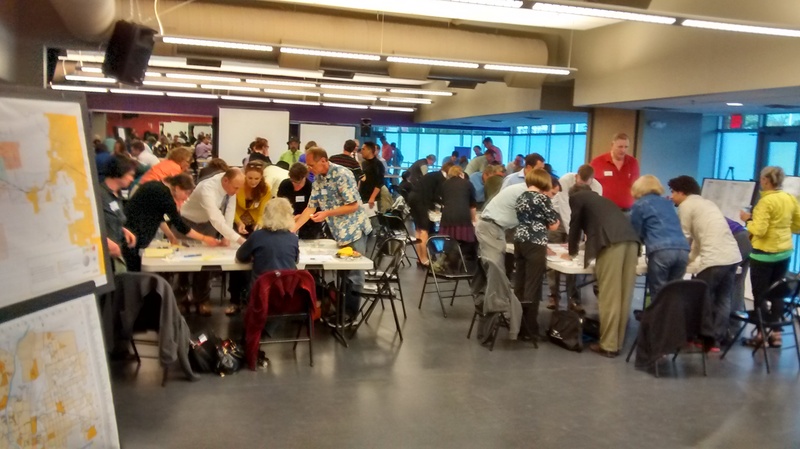 One thing everyone agreed on was a need for an improved transportation network based on better transit, more biking connectivity, and walking-compatible streets, neighborhoods and districts. 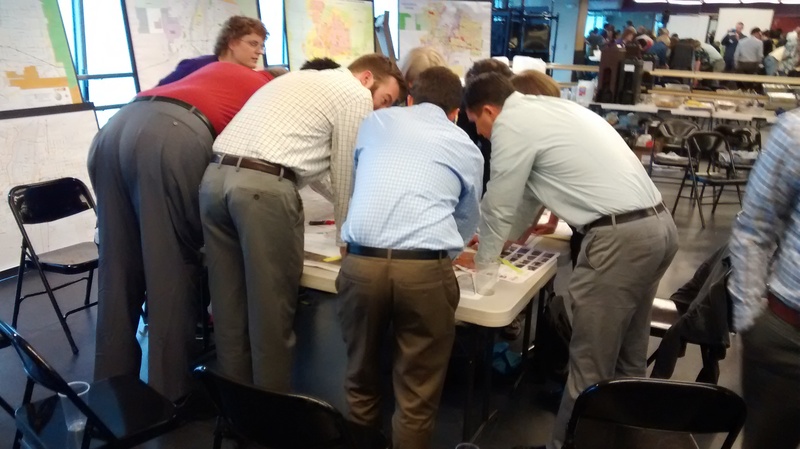 When polled to rank the priorities for transportation investments, participants ranked biking first, pedestrian second, and ‘traffic management strategies including smart signal timing’ third. However in the current plan no type of street configuration or development form lists bicycling as higher than third in the modal hierarchy. People sense the need to do better at integrating bicycling. It is a careful exercise to match activities to places, and demands a subtle synthesis of knowledge of the needs of human communities and the characteristics that merge together to define a place. If you get the chance, go to one of the June workshops! The diversity represented is extremely important. What kind of changes do people want to see on the ground? What kind of businesses does Albuquerque want to attract? 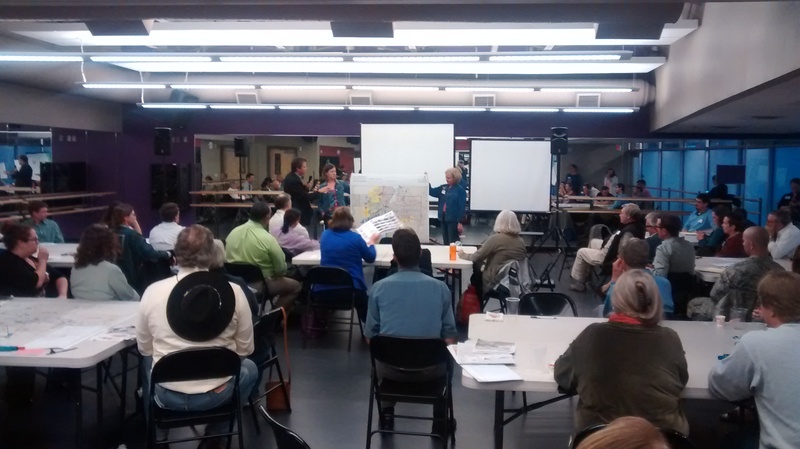 Is it time to complete a pedestrian plan for Albuquerque/Bernalillo County? The guiding principle is listening, to learn more of the places individuals have experience with, intimately know and care about. One of the most valuable experiences for me was meeting fellow citizens and expanding my sense of the region from the perspectives they shared. This process helped me feel more at home here. When you get to know the individuals that make up this city, you gain admiration, respect and understanding for your neighbors and the professionals working hard to serve everyone. Join the process! It’s fun. https://www.cabq.gov/planning/publications City of Albuquerque planning docs. 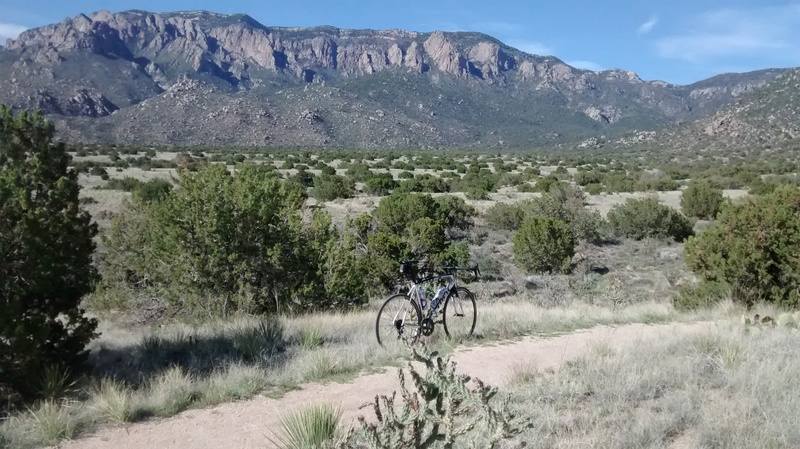 This entry was posted in Albuquerque, planning, Public Participation on May 26, 2015 by bikeyogiblog. The plan is designed to “Improve Safety for All System Users” (Goal 2), and “Provide Multimodal Access and Connectivity for Community Prosperity” (Goal 4). Take a look and feel free to provide comments, feedback and suggestions to enhance the plan. 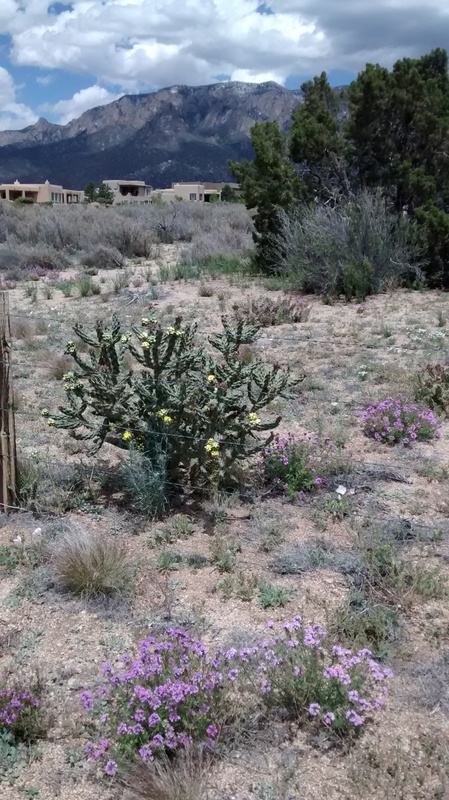 New Mexico needs your unique perspective. Even if it’s as simple as ‘I bike and like that you are including planning for better bicycling for us and future generations’. Voices from the community provide direction for elected representatives and professional staff. You can also email comments in. 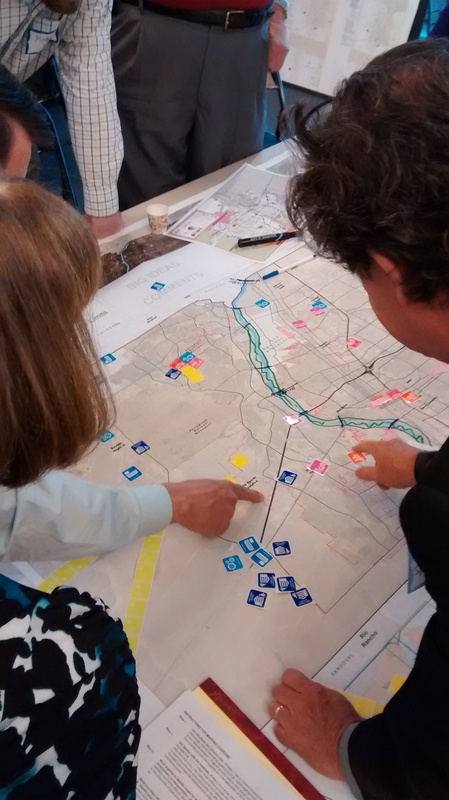 Bicycling opportunities will take shape depending on how we plan. 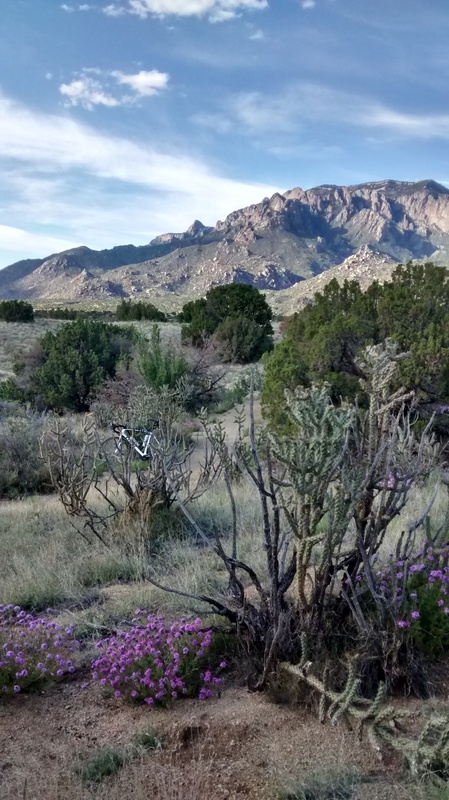 Enjoy your weekend bicycling NM. 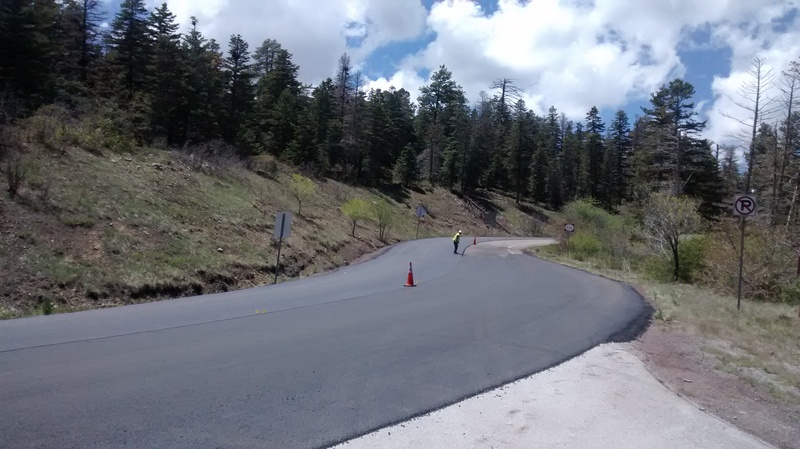 last summer NMDOT repaved the first 6 miles of the Crest road. This summer they are doing the rest! Thank YOU! 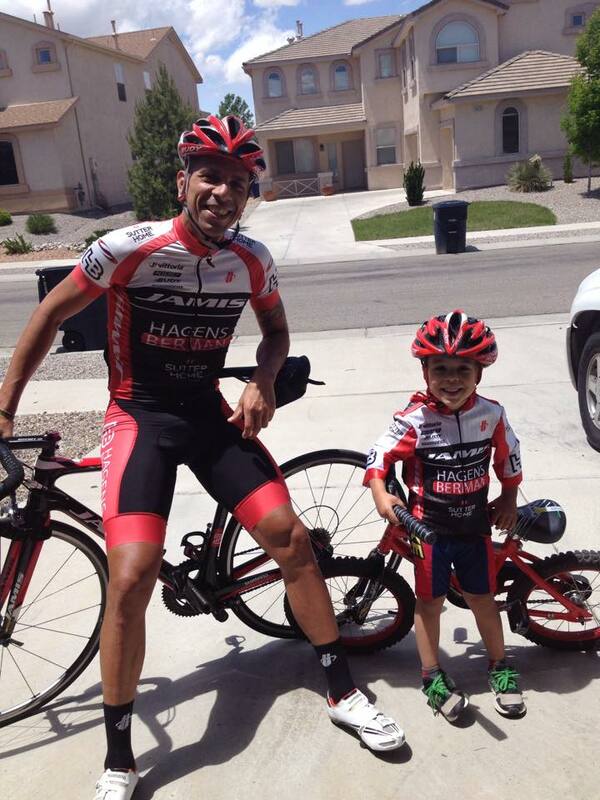 Smiles roll from happy cyclists. 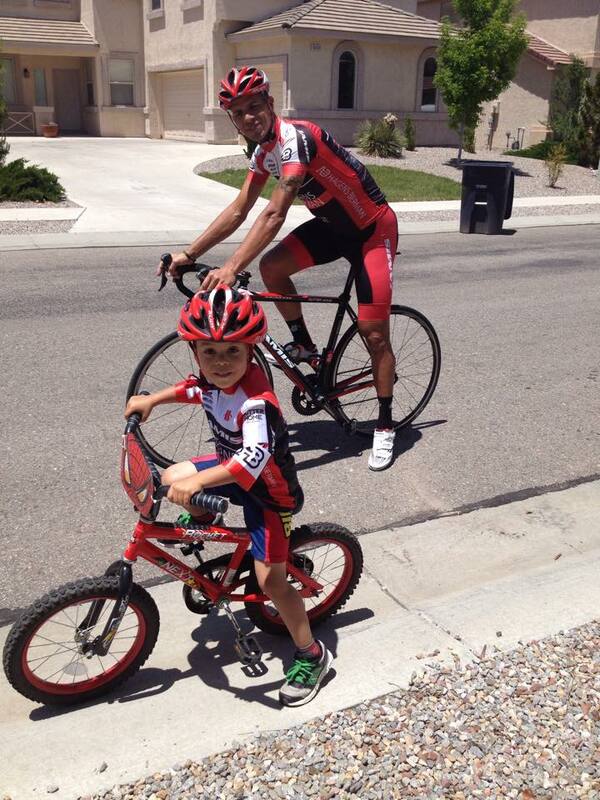 Families are finding biking is a good way to spend time together. 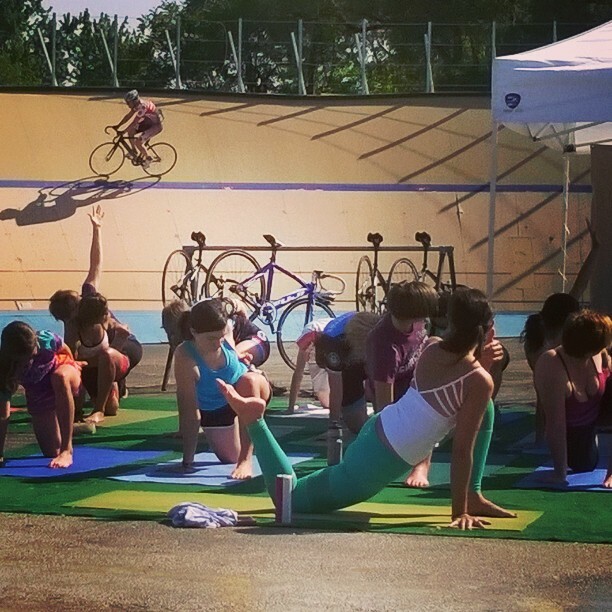 This entry was posted in community news, planning, Public Participation on May 24, 2015 by bikeyogiblog. 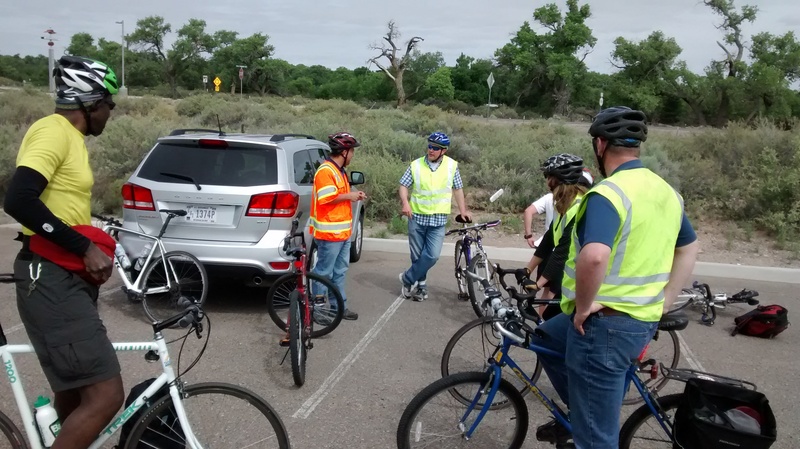 On May 21 I participated in a bike and pedestrian safety assessment as part of the US DOT action plan to better support bicycling and walking choices. We focused on NM 313 which runs along the Rio Grande’s fertile farmlands through the Sandia Nation to the town of Bernalillo. It is a popular bicycling route because of the level terrain and smooth flow. 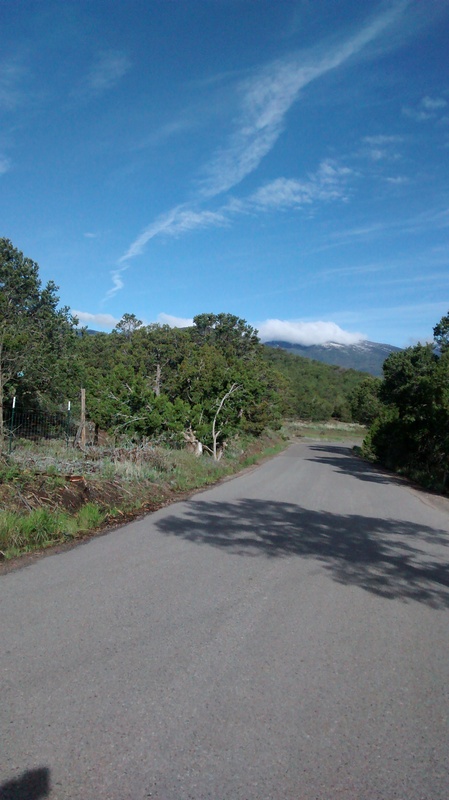 The road has moderate traffic, a rural feel, and open vistas of the mountains. Fields of corn, Sandhill Cranes and birdlife, and pastures with livestock and horses speak to the ecological bounty here. Because of initiatives such as Complete Streets and this safety assessment that focus on including viable bicycling and pedestrian transportation choices, planners and engineers are starting to advance the integration of these modes by using bicycles as a design vehicle for roadways, and including better places for people to walk. Using the bicycle as a design vehicle means the road is planned, designed and built to specifically accommodate bicycles, just as roads are crafted for commercial vehicles and private automobile traffic. Seeing pedestrians and bicyclists as regular and expected traffic shifts thinking and approaches. The goal is to design travel environments that encourage and empower people to make healthier choices. Education coupled with inclusive design strategies help guide safer user behaviors. 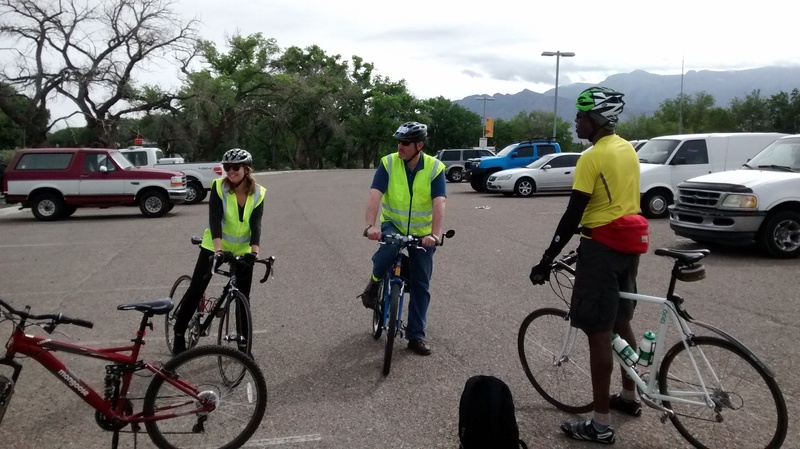 Transportation engineers see cyclists and pedestrians as important customers. During the safety audit we focused on improving the travel environment and better supporting people already taking the initiative to walk and bike. We brainstormed new standards and processes to accommodate the demand for more walking and biking as we reinvest in infrastructure during this critical time when interest rates are low and the need for improvements and putting our workforce to use to solve the problems of our times is high. We are one united team. 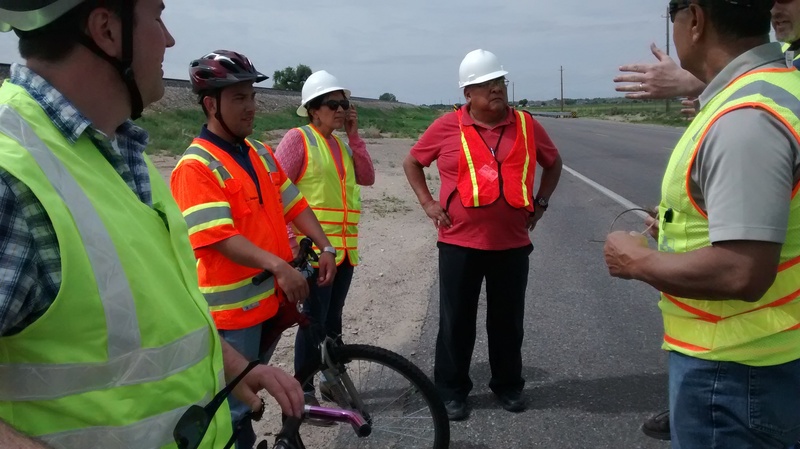 We had a lot of great insights from the team of US and New Mexican engineers, Sandia Pueblo people, health and wellness practitioners, safety experts, and transportation planners. We all put walking and bicycling hats on and worked together to get ideas out. We realized people are walking and biking now for the same reason people are driving, to get somewhere, to go about business, to naturally live daily life. And young people especially are doing things differently including exercising choices to add more bicycling, walking and transit into daily routines. We have a lot of work to do to build a framework more hospitable and supportive for every person choosing walking and bicycling. This process ensures the public sector works in the public interest. This is the test of a generation to establish a vision of what we really can be. 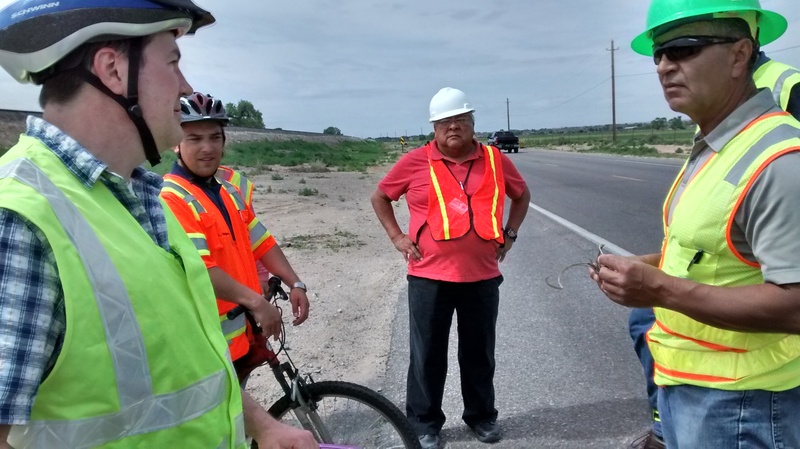 New Mexico is a focus State for bike and ped safety due to an unusual rise in collisions resulting in injury or death to people walking and biking. One of the most vital parts of the action plan is the network of alliances we are creating to support active transportation options. The US DOT is bolstering resources for all involved. They have a guide for citizens to increase livability in their communities and neighborhoods, innovative design guides for engineers, and education programs for safe routes to schools and community activity centers to empower residents to walk and bike with confidence. Instead of moving in a manner as if we are just passing through, people are locating themselves in distinct places and putting roots down. 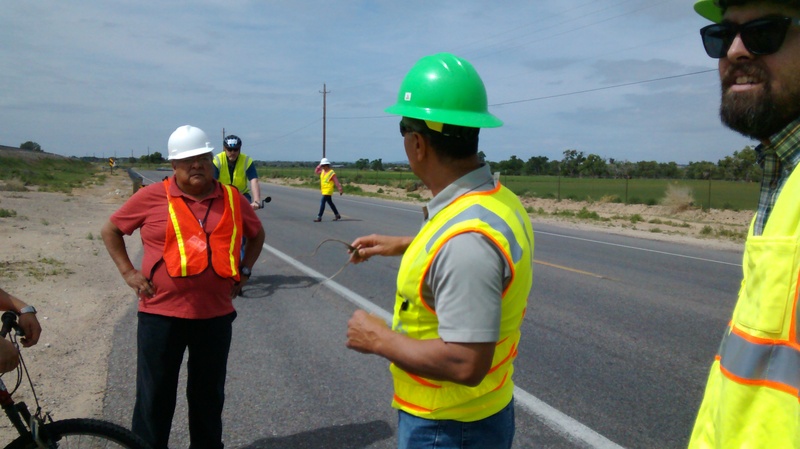 Building roads better fosters stronger connections and has universal benefits for everyone. I am looking forward to applying this knowledge we are developing for making roads safer for kids and helping everyone feel comfortable in choosing to walk or ride a bike to get wherever people may want to go. Thank you for your help and focus on this important effort. 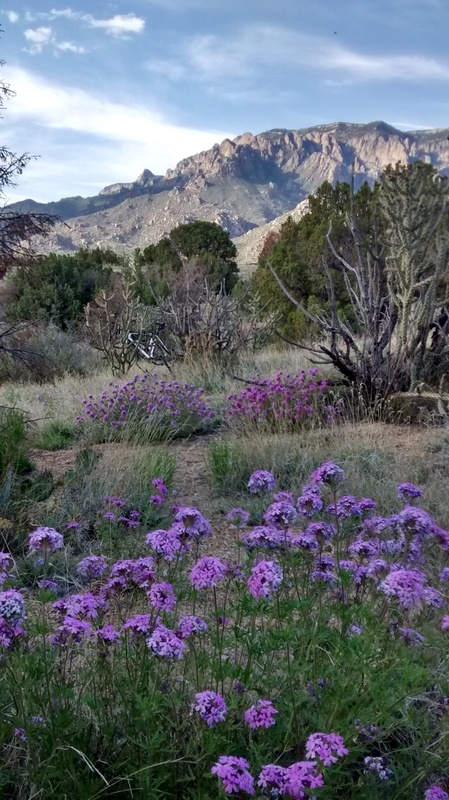 The New Mexico Touring Society has a route called the Bernalillo Blast . 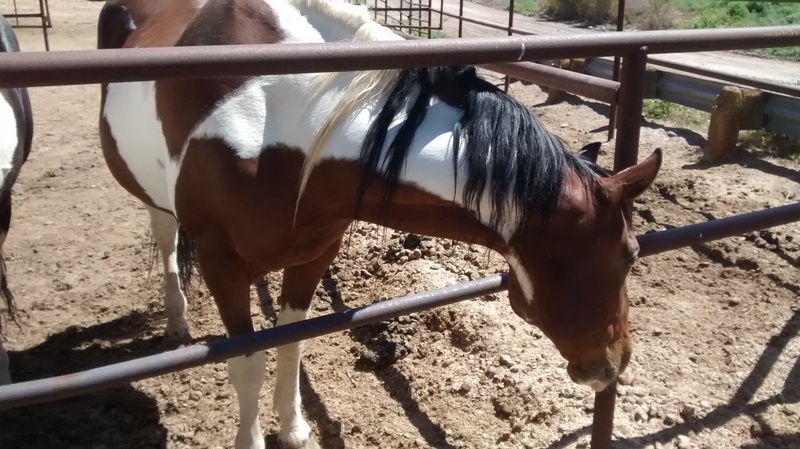 …More rides that can include 313, the traffic circle, or “Roy Road” past the Sandia Police Station. The League of American Bicyclists 5 E’s (Education–traffic skills, Engineering-safety, Encouragement–welcome & celebrate, Evaluation and Planning, Enforcement of Laws). Safety Edge, a proven countermeasure to help vehicles maintain control when operating near the edge of the roadway. “Vertical pavement edges are a recognized detriment to safety.” (FHA) Coupled with flush, level, gap free, smooth transitions from travel lanes to shoulders and bike lanes, the safety edge improves road design even further for all vehicles. Maintenance Strategy–Maintain shoulders and bike lanes and keep them clear of hazards. 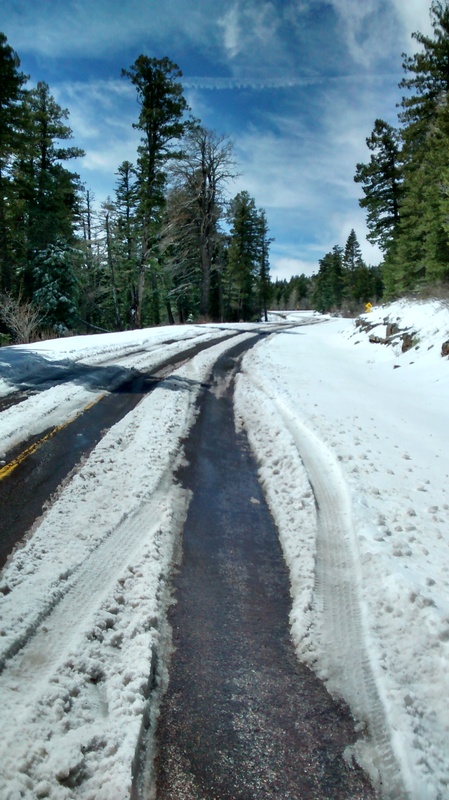 This entry was posted in Bike Sense = Design & Education, community news, Elements of Cycling, healthy roads, initiatives, planning, Uncategorized, Walking on May 22, 2015 by bikeyogiblog. Albuquerque City Council unanimously adopted the Bikeways and Trails Facility Plan on May 18, 2015. This plan builds on many years of hard work and specifies next steps in the progression for increasing bicycling friendliness. The plan’s champion Councilor Isaac Benton said this was a long time coming and took a multi department effort that was boosted by advocacy from the entire community. 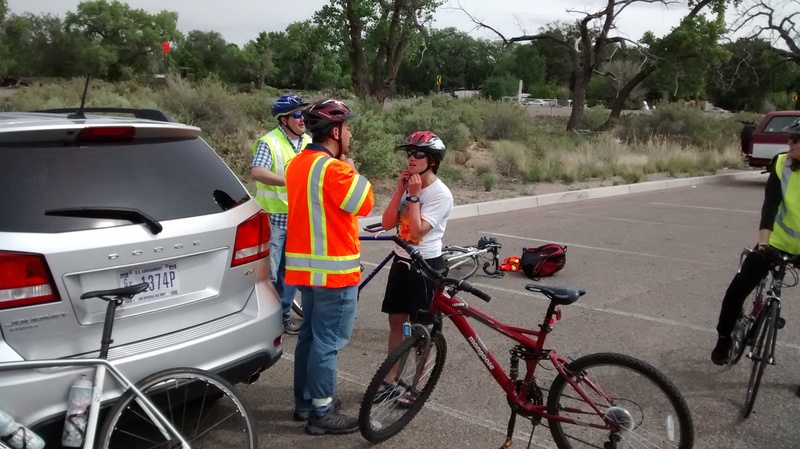 Bicycling is generating an atmosphere of excitement in Albuquerque, NM. I’m including a link to the actual City Council proceedings because it tells a tremendous story. 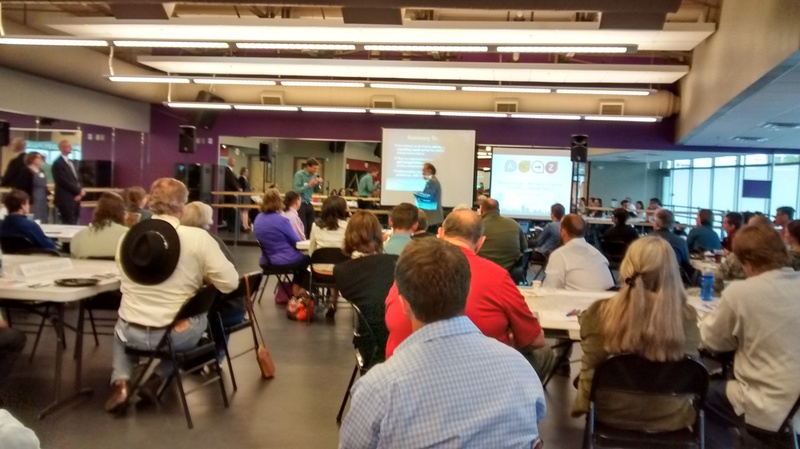 This was a community moment where the long struggle to realize a vision of better bicycling was recognized. The prevailing sense is that bicycling connects people together, and better bicycling advances all of humanity. People really want this, and are doing the work to make it happen. There was a pause to take stock and celebrate all the hard work it has taken to get the plan this far. It hasn’t been easy, but challenges increase rewards, and people were feeling the joy in that. There is also a sense of focused excitement and obligation of duty–a sense of purpose–that there is more to come as we look toward the horizon. We can apply what we’ve learned and use the innovations happening in cycling transportation to carry momentum forward into the implementation process. We want to keep everyone involved and engage more people in sharing the enthusiasm for bicycling. Four speakers provided public comment prior to the vote. Mike Trujillo recounted how safety has improved and new facilities have opened up access for bicycling. He uses the Gail Ryba bridge to reach the west side and the Coal, Lead, and MLK Blvd. improvements help connect downtown and the river to the university, the community college, Nob Hill, and the southeast neighborhoods. Stephen Verchinski urged everyone to keep pushing for elevating Albuquerque’s bicycle friendly status. Stephen advocated for ongoing leadership from Council. Channeling our care and energy, we can aim for silver, then gold level status for bicycling friendliness, and beyond. John Thomas provided community perspective on the importance of access for all kinds of users. John emphasized connectivity, and building up the engineering practices for bicycling and walking transportation. Julie Luna discussed achievements in consistency and coordination with long range planning efforts at the regional level, and the cooperative spirit developing between different agencies. Everyone sees our understanding of how to better accommodate people bicycling and walking is evolving. The Council’s reflections on their own bicycling activites produced smiles. Councilor Sanchez recognized the effectiveness of Councilor Benton’s engagement with stewarding bicycling. The pay off is huge. We see what we’ve learned on this journey and channel our efforts to galvanize community and unite us as one team working for a common goal. 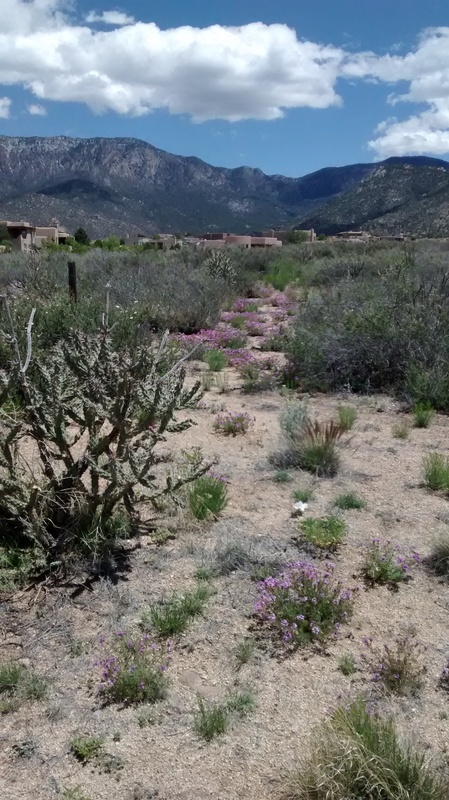 The Council recognizes the affinity of Albuquerque’s relationship with health, wellness, and vibrant outdoor life. Council President Rey Garduño spoke of Albuquerque as a place that is mentioned in the same breath as world class bicycling. That is a vision worth working towards. Thanks to continuous work on refining the bike and trails plan, we have a good roadmap for taking the next steps. It takes a whole team and the entire city staff should be commended. Planner Carrie Barkhurst and city council staff Andrew Webb were both recognized by City Council for providing a high level of leadership and keeping the different elements–elected officials, professional staff, community advisors and advocates–involved and moving forward. A particular note of accomplishment is the emphasis on user friendliness in the bikeways and trails system. The user experience is always placed at the center, and Carrie and Andrew led the way for keeping everyone in touch with that and working together. Finally some photos I took yesterday on my lunch ride. 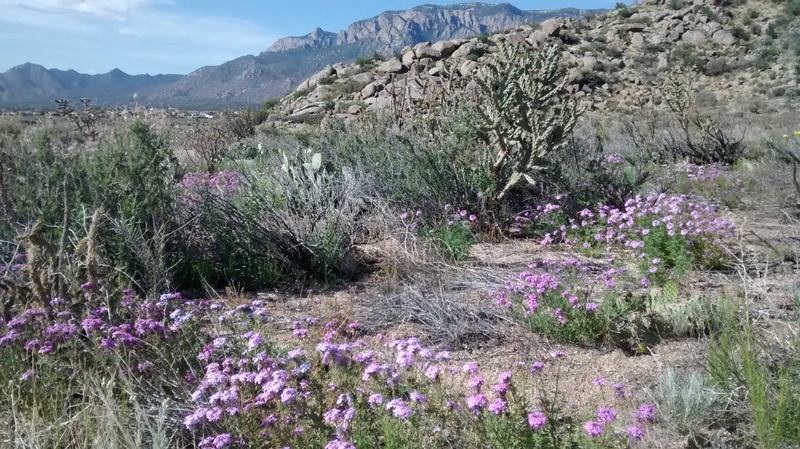 Give the desert some rain and it blooms to purple. What a place to live, work, and bicycle. I love bicycling in Albuquerque. 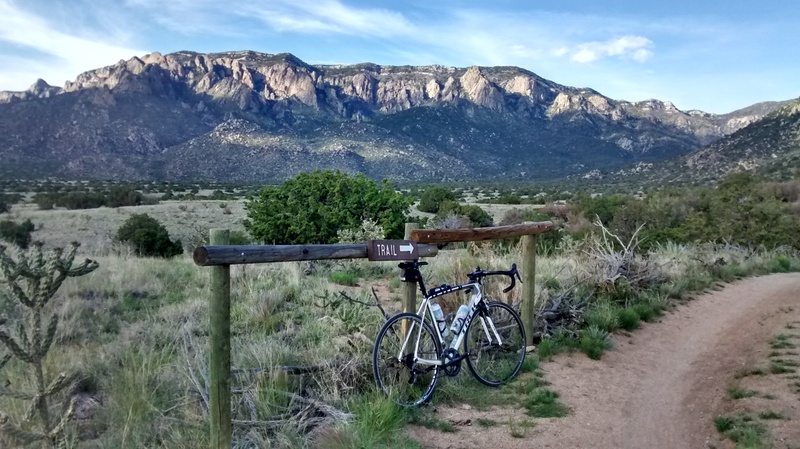 This entry was posted in Albuquerque, Albuquerque Bike Culture, biking New Mexico, community news, planning on May 19, 2015 by bikeyogiblog. 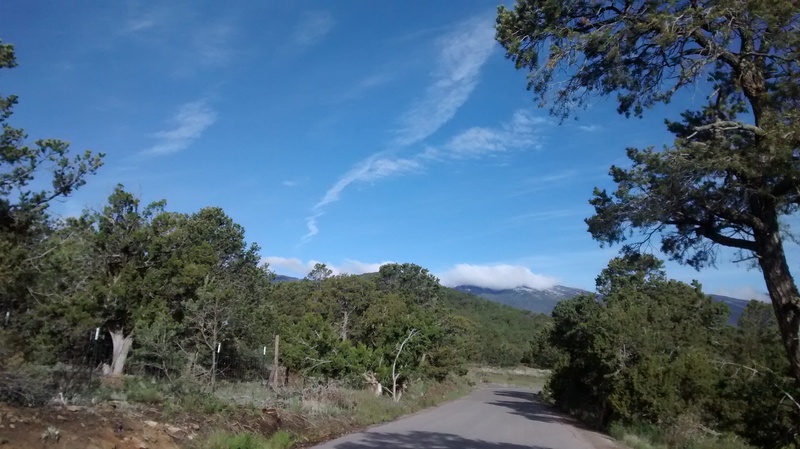 On Sunday morning I rode the Sandia Crest road race course starting from my home in Albuquerque. The Crest race is coming up in three weeks. These roads are some of my favorite riding anywhere and I have access from the doorstep of my home. Love it here. 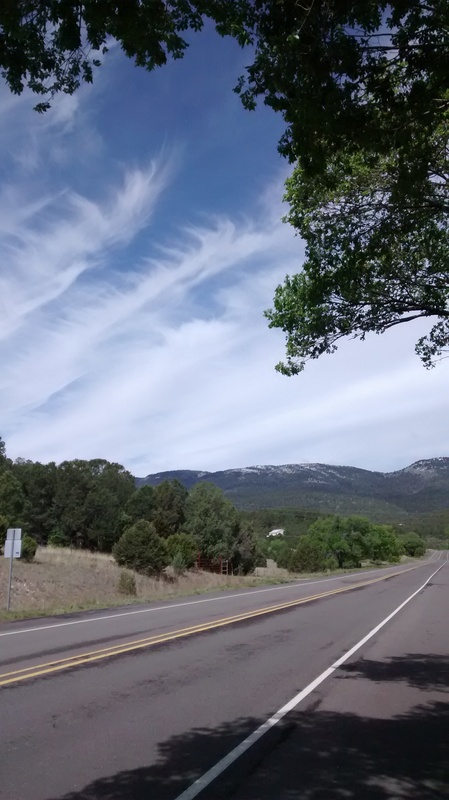 I overlapped with the Sante Fe Century riders as I went over Heartbreak Hill and through the San Pedro mountains. The riders were all smiles and they have volunteers and aid stations everywhere. I’d like to do that sometime but this year preferred to keep it simple. When I turned up the Crest road snow was still melting off. At 3,000 meters I had to turn around. 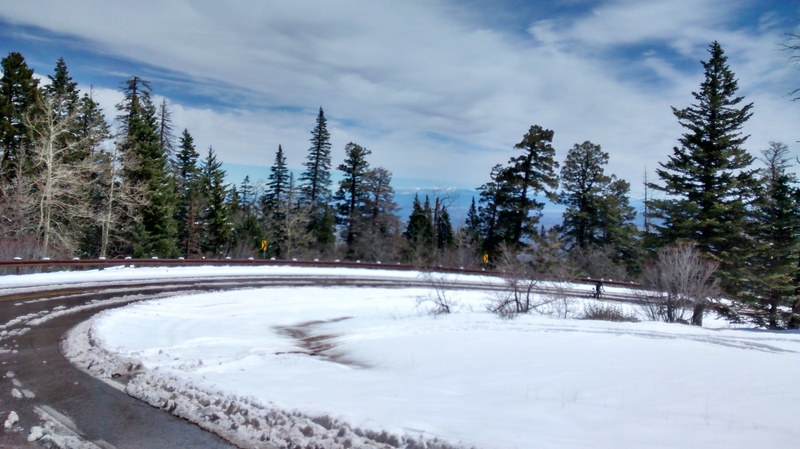 Riding a bicycle up the Sandia Crest quiet like, I was drawn into the tapestry of the landscape like melting snow. It was a beautiful day in the calm after the stormy weather. 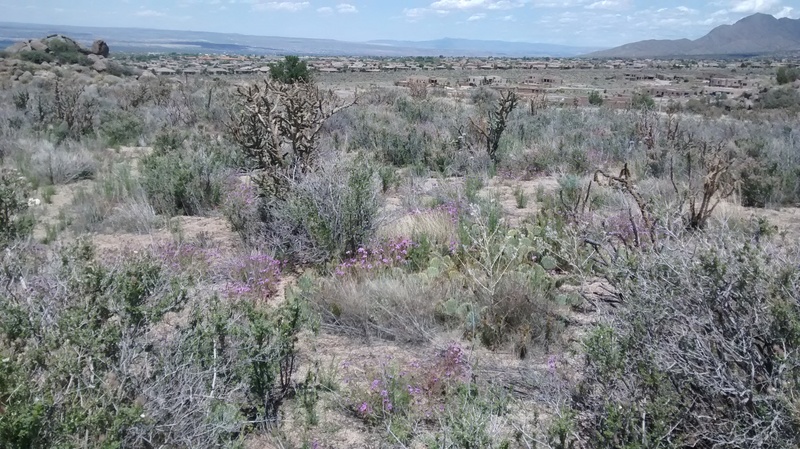 I appreciate being able to cycle out into the open spaces east of Albuquerque and up into the mountains. I talked with Mai this morning. She is on an international education recruiting trip in Japan. She met a professor nearing retirement who is moonlighting on creating a cycling network in his hometown of Kanazawa, Japan. Mai showed me some of the brochures and maps he’s made to promote cycling activities (we were talking on Apple’s video program FaceTime). The cycling movement is intergenerational, democratically based, and reaches out in a strategic direction to assist with all the problems of our time–energy, transportation, environment. People all over the world are using cycling to galvanize public purpose and invest in common good. It takes focusing the public will on visualizing what we can become to create more free choices in the transportation system. Riding up the Crest helps me tune in to the kind of environment we want to be operating in. 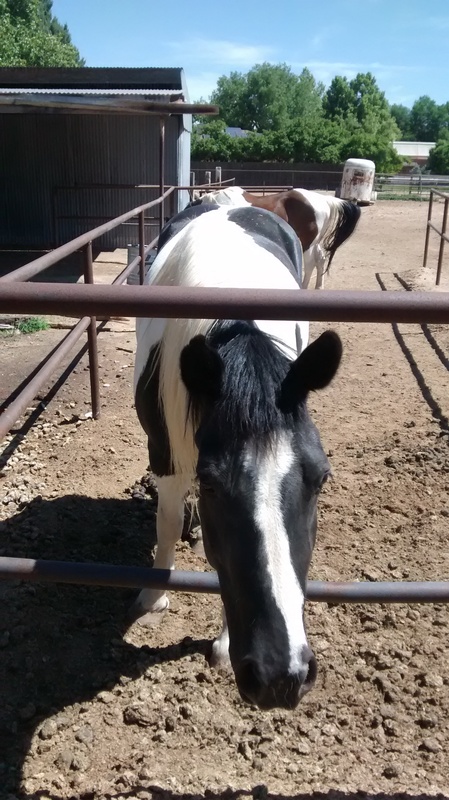 Exercising the free will to ride, and learning about what others are doing, is inspiring. I’m grateful for this Sunday’s ride on the Crest to lift my spirits. Mai’s photo. 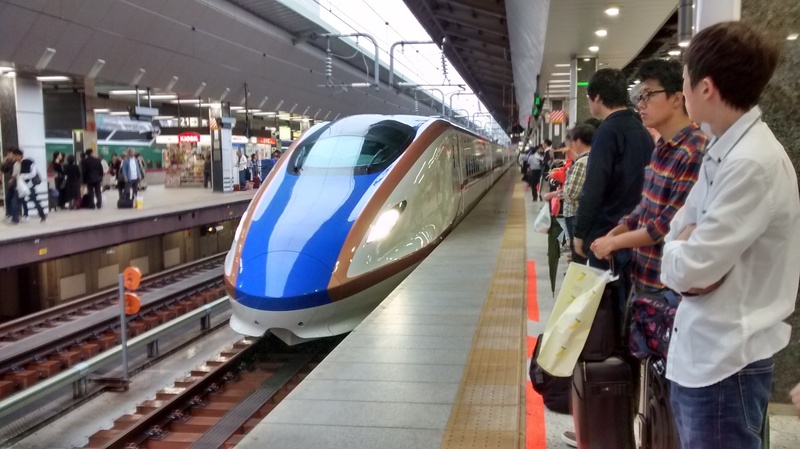 Japanese trains have huge legroom (adding length in trains is easy) and riding one is like flying on rails. 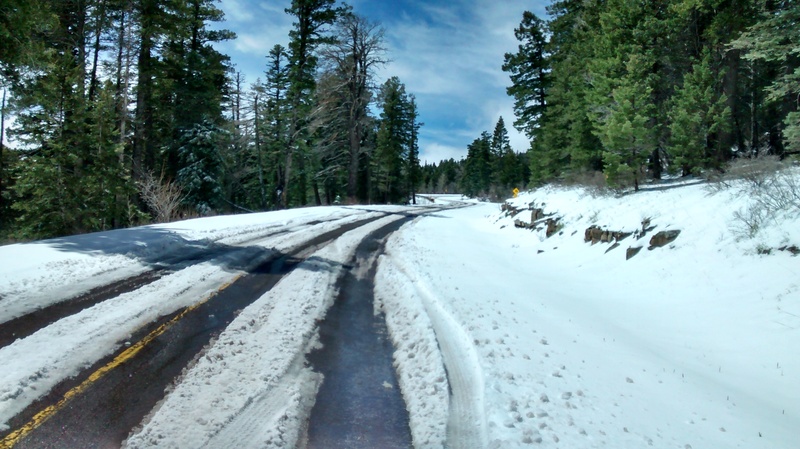 This entry was posted in Everyday Rides, Landscape, planning on May 18, 2015 by bikeyogiblog.